An Cetorhinus maximus in uska species han Lamniformes nga syahan ginhulagway ni Gunnerus hadton 1765. An Cetorhinus maximus in nahilalakip ha genus nga Cetorhinus, ngan familia nga Cetorhinidae. Ginklasipika han IUCN an species komo nadudultan. Waray hini subspecies nga nakalista. ↑ 1.0 1.1 "Cetorhinus maximus". IUCN Red List of Threatened Species. Version 2012.2. International Union for Conservation of Nature. 2005. Ginkuhà 24/10/2012. ↑ 2.00 2.01 2.02 2.03 2.04 2.05 2.06 2.07 2.08 2.09 2.10 2.11 2.12 2.13 2.14 2.15 2.16 2.17 2.18 2.19 2.20 2.21 2.22 2.23 2.24 Compagno, L.J.V. (1984) FAO Species Catalogue. Vol. 4. Sharks of the world. An annotated and illustrated catalogue of shark species known to date. Part 1 - Hexanchiformes to Lamniformes., FAO Fish. Synop. 125(4/1):1-249. ↑ 4.0 4.1 4.2 4.3 4.4 4.5 Compagno, L.J.V. 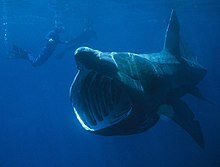 (2001) Sharks of the world. An annotated and illustrated catalogue of shark species known to date. Volume 2. Bullhead, mackerel and carpet sharks (Heterodontiformes, Lamniformes and Orectolobiformes)., FAO Species Catalogue for Fishery Purposes. No. 1, Vol. 2. Rome, FAO. 2001. 269p. ↑ Bauchot, M.-L. (1987) Requins., p. 769-843. In W. Fischer, M.L. Bauchot and M. Schneider (eds.) Fiches FAO d'identification pour les besoins de la pêche. (rev. 1). Méditerranée et mer Noire. Zone de pêche 37. Vol. II. Commission des Communautés Européennes and FAO, Rome. Ini nga pakli kataposan nga ginliwat dida han 14:13, 13 Oktubre 2014.